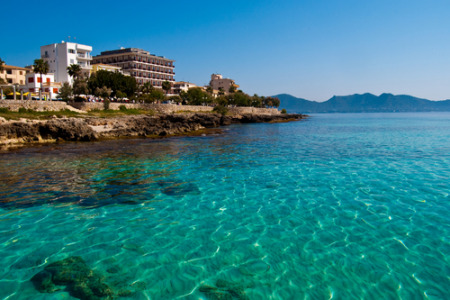 Holidays to Cala Millor take you to the largest and liveliest resort on the east coast of Majorca. It is a purpose built resort which offers a variety of recreational activities both in and out of the water. Cala Millor holidays can be taken from April until late October when the temperature ranges from low twenties to mid thirties. Holidays in Cala Millor have broad appeal with families looking for sandy beaches with safe bathing for children and young adults looking for a lively nightlife. We have a surprising number of cheap Cala Millor holidays offering great value with good accommodation and amenities. Numerous restaurants cater for all tastes and shopping is good. The nearest market is at Son Servera which takes place each Friday, but a visit to the Monday market in Manacor is recommended. It is the centre of the island's pearl industry and a good place to get a rather special souvenir. If you are looking for a guarantee of summer sun in a pleasant resort on this charming island, surf through our low cost Cala Millor holidays to find one to suit your needs. For further information, and to find our latest Cala Millor holiday, offers use the search facility.